The black slave drivers were placed in an awkward position, were they were unsure of which side they should choose. 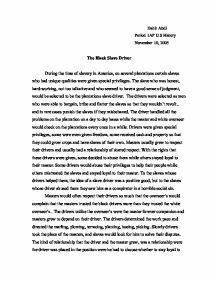 Dahir Abdi Period 1AP U.S History November 10, 2005 The Black Slave Driver During the time of slavery in America, on several plantations certain slaves who had unique qualities were given special privileges. The slave who was honest, hard-working, not too talkative and who seemed to have a good sense of judgment, would be selected to be the plantations slave driver. The drivers were selected as men who were able to bargain, bribe and flatter the slaves so that they wouldn't revolt , and in rare cases punish the slaves if they misbehaved. The driver handled all the problems on the plantation on a day to day bases while the master and white overseer would check on the plantations every once in a while. Drivers were given special privileges, some were even given freedom, some received cash and property so that they could grow crops and have slaves of their own. ...read more. The kind of relationship that the driver and the master grew, was a relationship were the driver was placed in the position were he had to choose whether to stay loyal to his people or his master. Some choose to stay loyal to their people while other stayed loyal to their master. The slaves who were aided by the drivers, saw him as a positive good. To these slaves the idea of having a slave as their master was beneficial because he could relate to them and go easy on them because he too was once a slave. Family members of the slaves were given special privileges. Slaves saw that if the master trusted his driver he would leave them to him. Some of the drivers would use the trust from the master to aid the slaves. Slaves from a wheat farm in Virginia, spoke of a driver who was sympathetic and helped one women because she was too weak. ...read more. Drivers would assign a light amount of work to their favorite slaves in particular their family and would assign a greater amount of work to their enemies. In retaliation of the drivers actions slaves would threat to kill the drivers and sometimes actually kill them. In one case a group of slaves slipped crushed glass into his food and killed him. In another case a slave revolted against his driver and killed his driver and cut him into small pieces so that it was easier to hide. This driver was despised by the slaves and seen as a devil. The black slave drivers were placed in an awkward position, were they were unsure of which side they should choose. They could choose to help their people and slowly help ended slavery or they could harbor their freedom and care less about their people. Some choose to help their people while other's decided to harbor their freedom. Those who helped their people were considered to be a positive good while the others were a traitors liars and scumbags. ?? ?? ?? ?? ...read more. JFK assassination - different theories and the evidence.